Vicki Brown never knew what she had lost. As a newborn, she was given a tiny copper ring. But her dad, a Canadian army officer, took the ring with him when he shipped out for duty in World War II not long afterward. When his ship was struck by a German torpedo, the ring might have been lost forever. Instead, it began a remarkable journey across the ocean, through years of dusty neglect and finally back into Brown’s hands for good Friday — the day before her 65th birthday. Along the way, it made Brown, who lives in Louisburg, a brief celebrity in Canada and reunited her with a family she had searched for in vain for decades. Growing up, Brown knew very little about her dad. For a while, she was convinced that she had been adopted. Unlike her friends, she did not have a father, and the only relatives she knew were her mother’s. At age 6, she asked about it. But her mother said very little about her father. She picked up a few more clues over the years, but the picture was always incomplete. She learned that his name was William Caldwell and that he died when she was a month old. She knew that he had brothers and sisters. She met her Aunt Florence’s family in Ottawa as a teenager, but she lost contact with them when she and her mother moved to California. When Brown decided to try to find out more about her father, it was too late. In 1983, her mother died. As Brown went through her possessions, she found a cedar chest filled with old letters and photographs. The letters were signed with first names only. They had been sent from Nova Scotia, but they had no return addresses. Her curiosity stirred, Brown called every Caldwell listed in Nova Scotia. None of them were the people in the letters. None of them were even of Scottish descent. Next, she tried finding her relatives in Ottawa. She remembered her Aunt Florence had a husband named Jim and a son named Glen, but she didn’t know their last name. A friend in Ottawa got a private detective to look into it, but he found nothing. Her last attempt was to write the Canadian government for her father’s military records in 1996, when she lived in Raleigh. They had nothing. Then, when she had mostly given up, the ring came back, and with it, her family. In 2000, a Canadian archivist noticed that some personal effects had been misfiled along with military papers belonging to William Caldwell. They tried to contact Brown, but she had moved to Louisburg. A staff member looked for her, but Brown was too common a name. Five years later, the Library and Archives Canada decided to include the items in an exhibit on the effects of the war on the home front. They renewed the effort to find Brown, contacting reporters in Canada and North Carolina. The News & Observer helped track down Brown, and she finally learned the story of her father last June. His ship, the S.S. Nerissa, was torpedoed by a German U-boat off the coast of Scotland on April 30, 1941. Warrant Officer William Caldwell and 205 others died at sea. Though the ship was 35 miles from land, Caldwell’s dog tags and the tiny copper baby ring attached to them somehow floated to shore. They were found and sent back to the Canadian government. They were then misfiled and lost. 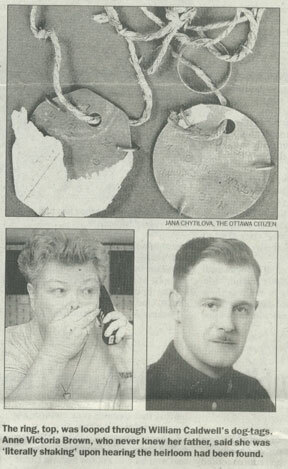 The story of the returned ring drew a lot of attention in the Canadian media, especially in Ottawa. Caldwell’s family there — including nine brothers and sisters — saw the story and got in touch with Brown. Last summer, she and her husband, Rex, went to Ottawa to see the exhibit and meet their newfound relatives. Brown gave the Canadian archives permission to keep the ring and the dog tags on display until the exhibit ended. On Friday, the Canadian government returned them to her in a ceremony at the N.C. Museum of History. In the past year, Brown has learned more about her dad. He was a career military officer who had been briefly stationed in Nova Scotia. (Those were friends, not relatives, that wrote him.) He was known for his sense of humor. More importantly, she has found a family that she never knew — all because of a tiny copper ring, a set of dog tags, an inattentive clerk and a little luck. Brown could be disappointed that she didn’t receive the ring or the dog tags when she was younger, but she thinks it worked out in the end. “If I had had them all along, I would never have found my family,” she said. In the spring of 1941, William Caldwell kissed his wife, Alice, and two-week-old daughter, Vicki, goodbye and headed for the battlefields of Europe. The 35-year old warrant officer from Kingston carried with him a child’s copper ring – a memento to stir thoughts of his new daughter. Off the Scottish coast, a German U-boat torpedoed the troopship S.S. Nerissa. Caldwell died, along with 205 other passengers in what was at the time Canada’s single worst loss of life in the war. But the final chapter in Caldwell’s story is still being written more than 60 years later. The ring was apparently found among wreckage that washed ashore. It was sent back to Canada, but the tiny copper keepsake was misfiled by an army clerk and never reached Caldwell’s family. Decades passed. 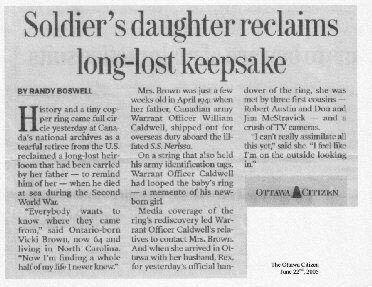 Then, during a 1999 search through warehoused boxes of old military records, a conservator at Library and Archives Canada discovered the ring. It was found with Caldwell’s identification tabs, all looped together on a cord inside a folder containing his service records. But now, after help from Can-West News Service and a U.S. newspaper, archivists have located Caldwell’s daughter – 64-year-old Anne Victoria Brown, a retiree living in North Carolina – and invited her to Canada to reclaim the lost-and-found heirloom that was somehow saved from the sea. “I can’t believe it. I’m literally shaking,” Vicki Brown said yesterday from her home in Louisburg, N.C., minutes after learning about the ring from Library and Archives curator Andrew Horrall. said a formal handover of the ring and Caldwell’s ID tags is being planned for next week. The artifacts, and the poignant tale they tell, are showcased in a new exhibit at the Ottawa archive – Written By War – documenting the impact of the Second World War on Canadian families. Vicki Brown was born in Kingston on March 25, 1941. Her father, a native of Scotland who became a career soldier after emigrating to Canada, was serving with the Royal Canadian Ordnance Corps when he shipped out for Liverpool from Halifax less than a month after his daughter’s birth. There were 290 people aboard the S.S. Nerissa, including servicemen and civilians, Canadians, Britons and Americans. On the night of April 30, the first of three torpedoes struck around 10:30 p.m. The deaths of 85 servicemen marked the first and only loss of Canadian troops on a trans-Atlantic crossing during the First or Second World War. Alice Caldwell was given the grim news by telegram, in stages, that informed her first that her husband was “missing at sea” and then, a few days later, presumed dead. Widow and daughter eventually moved to Toronto, where Vicki grew up and went to high school. In 1957, they moved to California – after doctors advised Alice she should move to a warmer climate. After her mother died in 1983, Vicki found a cedar box in which some of her father’s letters had been kept. The discovery stoked her interest, and she began searching for her Caldwell relatives in Canada, but with almost no luck. In 199, while living in Raleigh, N.C., she wrote to Library and Archives Canada seeking information about her father. At the time, however, Caldwell’s military records – and the ring he’d once carried as a reminder of his daughter – had not yet been discovered. When Mr. Horrall began gathering documents and artifacts as chief curator for Written by War, he seized upon the Caldwell file as a perfect example of the “intimate and personal” impact of war. A link was made to Ms. Brown’s 1995 request for information, and Mr. Horrall tried to contact her. But she was no longer living in Raleigh, and other attempts to trace her whereabouts proved fruitless. Last week, Can-West News asked the Raleigh News & Observer if it could help locate Ms. Brown through state property records and other sources. One of the paper’s researchers found her living in Louisburg. Re: Soldier’s daughter reclaims long-lost keepsake, JUNE 22. As a result of Randy Boswell’s June 7 article, our Caldwell family reunited with our cousin Vicki Brown of North Carolina. 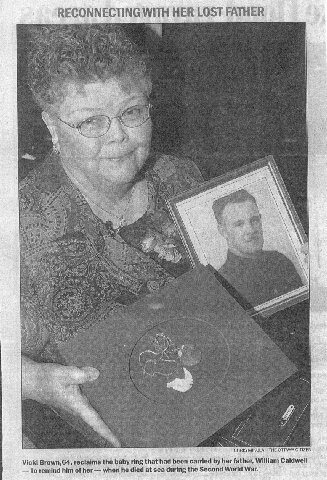 On June 21, during a ceremony at Library and Archives Canada, Vicki was reunited with her past, especially with her late father William Caldwell and her baby ring, both lost at sea during the Second World War. We were overwhelmed with the way Vicki and her husband Rex were received and hosted by the Library and Archives during a very emotional time in her life. During a family tour, both were awed by the beauty and cleanliness of our city and by the kindness of the people they encountered. These experiences made us very proud of our city and our country. Thank you to the staff of the Library and Archives and the Canadian War Museum, as well as the media and everyone else who made this such a memorable occasion.